PRODUCT: EternaBond AlumiBond AS-6-50, 6 inch wide x 50 foot roll. Heavy aluminum faced peel/stick flashing, roof repair and waterproofing tape. 15 year Eternabond Warranty. Made in USA. Price/Roll. Duct Work (rooftop and severe environments). Available in 2, 4, and 6 inch widths. EternaBond AlumiBond leak repair tape has a heavy aluminum facing (requires no UV protection). 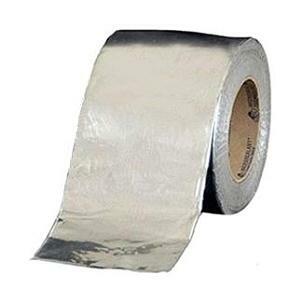 The aluminum facing is 4-mil thick aluminum sheet (not 2-mil foil like roof-seal most tapes). Tape is 20 mils thick. The patented adhesive has an integrated primer which allows AlumiBond to BOND with the surface it is installed on. Perfect for re-seaming all roofs, regardless of the material, AlumiBond makes a permanent water-tight seal (except silicones). Also great for tank repairs. Elongation factor greater than 700% guarantees AlumiBond will flex, expand and contract in all conditions, even on liners!